The Query tab is used for agents (and smart adornments) only. 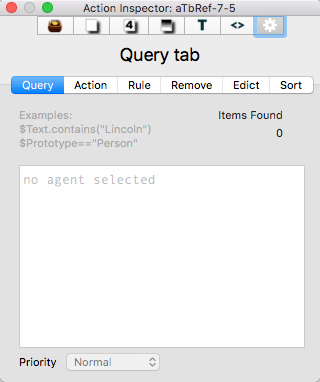 The main input box is used for adding or editing a query ($AgentQuery). Pressing the Return key commits any changes made and runs (or updates) the query. The code box has auto-completion for action code and attribute names (based on using a $-prefix). The number of items currently matching the query, i.e. the child count of the agent is show at top right. Priority. This pop-up controls whether the agent is 'on' or not. Sets $AgentPriority. See more on controlling agent priority. Note that an agent's query, action and priority can also be set from the agent tab of the Get Info pop-over.